• Social interaction plays a fundamental role in the process of cognitive development. In contrast to Jean Piaget’s understanding of child development (in which development necessarily precedes learning), Vygotsky felt social learning precedes development. He states: “Every function in the child’s cultural development appears twice: first, on the social level, and later, on the individual level; first, between people (interpsychological) and then inside the child (intrapsychological).” (Vygotsky, 1978). • The More Knowledgeable Other (MKO). The MKO refers to anyone who has a better understanding or a higher ability level than the learner, with respect to a particular task, process, or concept. The MKO is normally thought of as being a teacher, coach, or older adult, but the MKO could also be peers, a younger person, or even computers. 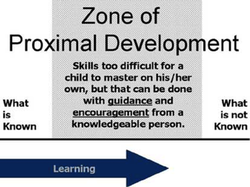 • The Zone of Proximal Development (ZPD) (see Figure 1. above). The ZPD is the distance between a student’s ability to perform a task under adult guidance and/or with peer collaboration and the student’s ability solving the problem independently. According to Vygotsky, learning occurred in this zone. Vygotsky focused on the connections between people and the sociocultural context in which they act and interact in shared experiences (Crawford, 1996). According to Vygotsky, humans use tools that develop from a culture, such as speech and writing, to mediate their social environments. Initially children develop these tools to serve solely as social functions, ways to communicate needs. Vygotsky believed that the internalization of these tools led to higher thinking skills. Summary: Social Development Theory argues that social interaction precedes development; consciousness and cognition are the end product of socialization and social behavior. • Curriculum - Since children learn much through interaction, curricula should be designed to emphasize interaction between learners and learning tasks. • Instruction - With appropriate adult help, children can often perform tasks that they are incapable of completing on their own. With this in mind, scaffolding - where the adult continually adjusts the level of his or her help in response to the child's level of performance - is an effective form of teaching. Scaffolding not only produces immediate results, but also instills the skills necessary for independent problem solving in the future. • Assessment - Assessment methods must target both the level of actual development and the level of potential development. What children can do on their own is their level of actual development and what they can do with help is their level of potential development. Two children might have the same level of actual development, but given the appropriate help from an adult, one might be able to solve many more problems than the other.